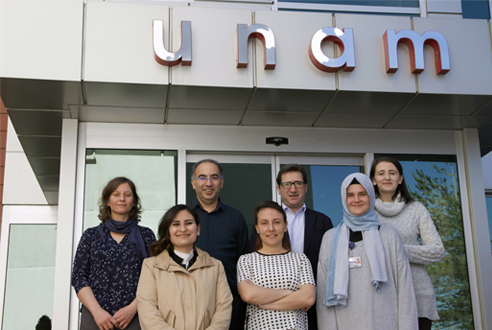 Bilkent UNAM and Nobel Pharmaceutical are stakeholders in an ongoing cancer antibody research and development project which is currently supported through TUBITAK 1003 priority areas research program. The aim of the project is to develop new generation of bifunctional antibodies for clinical use. Currently Synthetic Biosystems Research Lab led by Assoc Prof Urartu Ozgur Safak Seker is responsible for designing the molecular constructs and clones, initial production and characterization of the antibodies whereas Nobel Pharmaceutical is responsible for functional studies on animals. Recently, a milestone in the project has been achieved and formation of the molecular constructs of four bifunctional antibodies is completed and cellular clones are formed. Dr. Seker and SBL team members Ebru Şahin Kehribar, Recep Erdem Ahan, Elif Duman and Behide Saltepe are carrying out advanced genetic engineering and protein engineering techniques to complete the task in a short time. Once the project is completed and along with the clinical trials the antibodies will be moved to the second stage for industrial production. Synthetic Biosystems laboratory is formed by highly skilled graduate students in genetic engineering and protein engineering. The research group is carrying out research to develop innovative cellular programming capabilities for synthetic biology with the aim of developing living pharmaceuticals, living biomaterials and engineered cell based therapies. With the rise of Biotechnological drugs and approaches in medicine, Bilkent UNAM’s Synthetic Biosystems Laboratory and Nobel Pharmaceutical are planning to extend their collaboration to develop new generation of drug candidates enabled by advanced biotech approaches. Synthetic Biosystems Research laboratory is a part of the life sciences section of Bilkent University UNAM (National Nanotechnology Research Center). Bilkent University UNAM, established as a ‘National Lab’ at Bilkent, promotes scientific and technological excellence globally in the fields of nanoscience and nanotechnology covering various disciplines. Bilkent University UNAM infrastructure has been selected for a special large-scale program under Law no. 6550 Research Infrastructure Support with over 100 Million TL of investment and operational budget. Nobel Pharmaceutical is a long-standing, internationally active pharmaceutical company founded in 1964 with one hundred percent national capital, representing the Turkish brand in a wide range of geographies with its half a century of experience and respectful history. Conducting its business operations in more than 20 countries via its own established agencies and affiliates. Nobel İlaç allocates 5% of its annual turnover to R&D activities.